Preventative maintenance in the fall ensures that you won’t be faced with big problems when snow arrives in the coming months. When you are doing your seasonal inspections, don’t forget to look down – the asphalt paving that makes up your parking lot, driveway, or walkways might also need some attention. Making room in your budget for preventative asphalt maintenance will keep your property looking great, increase safety and even save you money in the long run. Completing relatively affordable projects like crack and pothole filling provide a great return on your investment as they have both immediate and long-term benefits. Asphalt surface inspection: Are there cracks or potholes that need to be filled? Cracks and potholes allow water to penetrate the surface of your pavement. During the inevitable freeze and thaw cycles of winter and spring, your asphalt pavement can be severely damaged by water under the surface. This extreme, expensive damage can be easily avoiding by following our asphalt paving fall tips. Water pooling evaluation: Do you see standing water? Making sure that water run-off is being managed correctly will help prevent damaging water penetration, and keep your asphalt free of the snow and ice that is sure to come this winter. Seasonal aesthetic evaluation: Is your pavement looking worn? Quick treatments like sealcoating can make your asphalt look like new again, greatly increasing the curb appeal of your property. Make sure you don’t leave preventative asphalt maintenance off of your fall to-do list. Proper maintenance on your pavement, from a reputable Madison, Oconomowoc or Milwaukee asphalt paving contractor will help extend the life of your asphalt, saving you money on costly projects like total replacement. For help with creating a custom plan for your property, download a free copy of our Autumn Maintenance Checklist. Our checklist will help you to evaluate your asphalt surface, and give you an idea of what you need to budget for this fall. 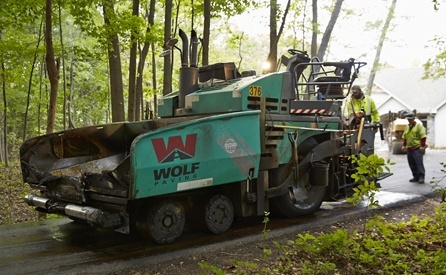 Wolf Paving offers professional paving services from Milwaukee to Madison, and everywhere in between, including all areas around: Sun Prairie, Oconomowoc and Waukesha. It’s never too early or too late to request a free paving estimate. Call Wolf Paving today to get help from the most experienced parking lot contractors in Waukesha. For the Milwaukee area, call us at 262-965-2121. For the Madison area, call us at 608-249-7931.